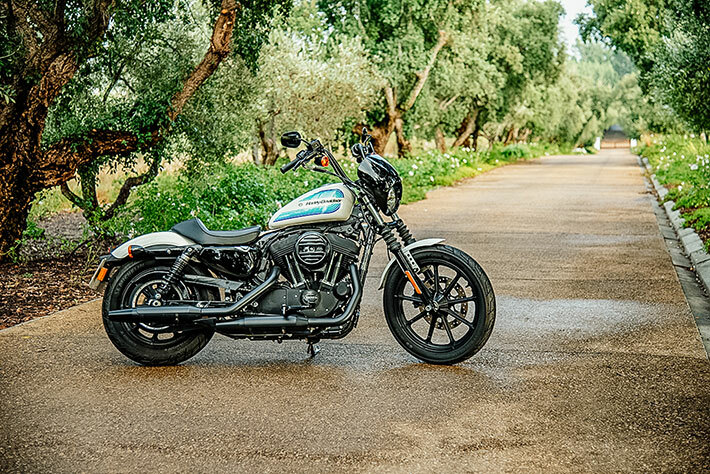 Harley-Davidson has been around since 1903 and is for many people the epitome of motorcycling; having a loyal following with their own unique style that cannot be matched by many other brands. You have to give credit to Harley-Davidson for working so hard at keeping its lifestyle and culture alive. 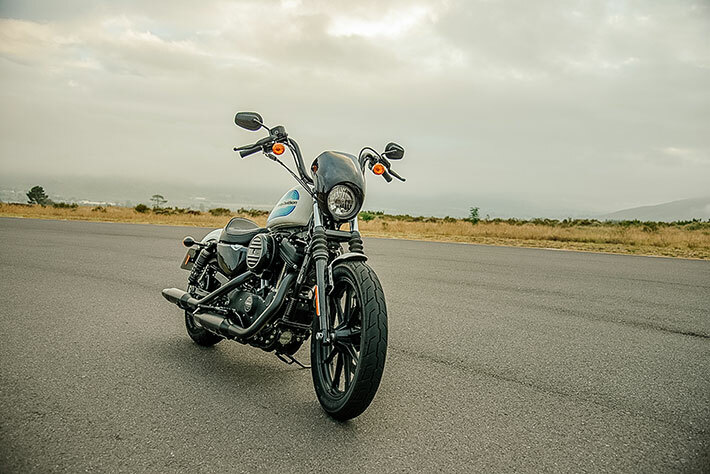 In 1957 Harley Davidson introduced the Sportster to the two-wheeler fraternity and it soon became a popular machine with the company’s cult following around the world – and it has stayed in production ever since. So when I approached H-D for a machine for this retro test, the logical choice was the new Iron 1200 (Sportster), which not only looks retro but has design cues that Harley-Davidson has retained by looking and listening to what its followers wanted, such as the ape-hanger bars and AMF racing tank decals and colours and fairing. In my opinion, it looks great and is very much a progression of the original 1957 design. The first good sign involved the hand-over briefing. “Everything is simple and straightforward. Here is the key. Please enjoy”. So I threw my leg over the saddle and fired up this beauty, and although it’s a Harley and has the looks and style, I was surprised to find it lacks the voice. I personally feel the boys have muffled her just a little too much – I’ve never heard a quiet Harley-Davidson before. However, the 1202 cm3 Evolution V-twin is unmistakably Harley and vibrates and moves like only a Hog can. Even selecting first gear has a familiar feel although it is a lot smoother than I remember. My first ride on the Iron 1200 was in peak-hour traffic and I was pleasantly surprised to find the bike actually makes a good commuter. It has a five-speed gearbox and first and second gears are perfectly set up for slipping along at 50 or 70 km/h on a packed five-o’clock highway, the bike’s narrow girth making it easy to slip between cars. With the very upright seating position and being so low down, coming to a stop and having to wait is just as comfortable. I have always found Harley indicator buttons a problem, and that’s because I’ve been riding Japanese bikes for way too long. The foot pegs also just seem an inch or so too far forward. As for the rest, it’s really great and user friendly. The engine pumps out 96 N.m of torque at 3 500 r/min and propels the 256 kg Iron along with the greatest of ease. Instrumentation is cool retro and hasn’t changed much since the early-2000s but provides all the info you need. The following day I took a ride out into the winelands, a gorgeous day with no wind and pleasant sunshine, ideal for cruising this Iron 1200. The ’70s retro style fuel tank only holds 12,5 litres and the spec is 5,2 litres/100 km so range is a limited. But the seat is comfortable and an hour in the saddle passes painlessly. The brakes are good; Harley has gone to a single disc both front and back, which again really looks very ’70s/’80s East Coast chopper, and they will stop you safely, even from a high speed. ‘Twisting her ear’ a little on a quiet stretch of open road, I was pleasantly surprised at the easy turn of speed and high-speed stability – nothing like a superbike but enough to ring up a naughty smile. Cornering is good but there is a limited lean angle, but the Iron is really more of a cruiser and you are not going to play with it in the twisty bits. 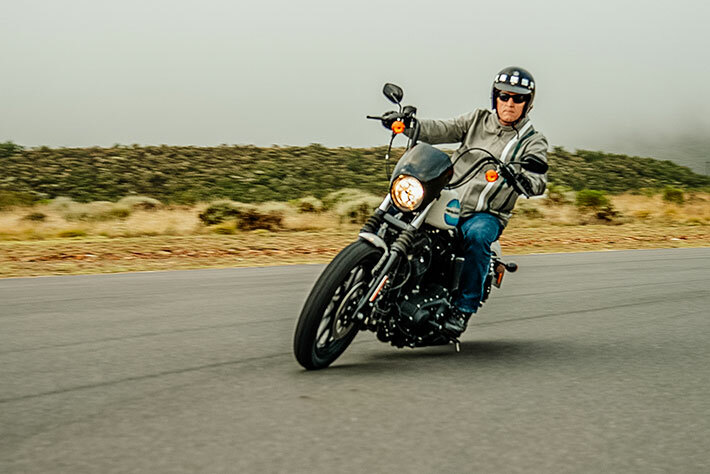 Having ridden a Sportster that was manufactured some 20 years earlier, other than the obvious improvements H-D has made over the years this 2019 Iron 1200 still feels pure classic Harley and that old saying springs to mind, ‘if it ain’t broke, don’t fix it’. I know the company is looking at bridging the gap and wanting to build bikes that compete more directly with the current Japanese, German and Italian machines. However, I’m sure Harley-Davidson will not forget its heritage in its future line-ups.